Open-Face Chinese is the most popular form of Chinese poker. It’s an unusual one if you’re used to No-Limit Hold’em. First off, this game is not played for chips, but points instead. The most characteristic element of poker, betting, is also eliminated. Your hand gets scored according to a standardized system. 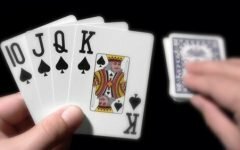 What OFC keeps from the “classic” poker games is the Hold’em hand ranking. But there’s a lot more that sets this type of poker aside from other poker games, not just the absence of betting. In game theory, NLHE and other poker games are classified as “imperfect information games”. 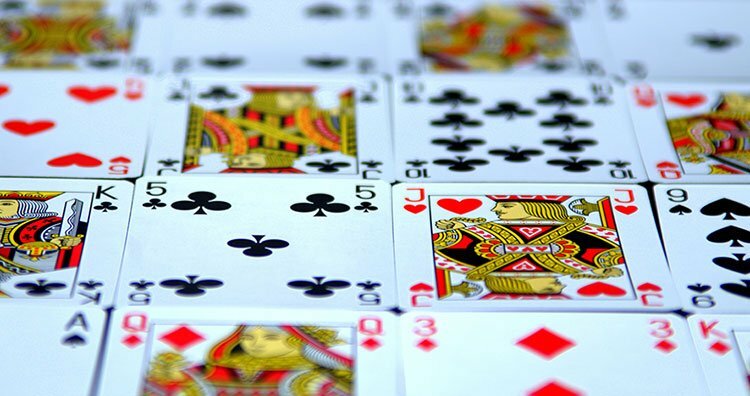 This means that a certain amount of information you have is hidden from your opponent – think of the two hole cards in NLHE. However, in a variety of OFC this is not true – everything you know about your hand, so does the other player. Even in the most common version, Pineapple, the only piece of information that is hidden from your opponent is the cards you discard. Open-Face Chinese cannot be played on PokerStars – although they did hosted a live OFC tournament in the 2013 PokerStars Caribbean Adventure. It’s never been featured at the World Series of Poker, only in the Carnivale of Poker. The Carnivale of Poker is a smaller tournament series that had a brief run, organized by the WSOP. However, it is available on TonyBet.com and on the Pineapple app for mobile. This is how the most common variation of OFC, the Pineapple version is played. Two or three players are allowed to play in each hand. Each player in the hand gets dealt 5 cards. Once they receive them, they turn them over immediately and arrange them according to the rules. Every player has 13 cards by the end of the hand. These 13 cards are arranged into 3 rows. These are the front hand, middle hand and back hand. The front hand consists of 3 cards, the middle and back hands consist of 5 cards. After the first 5 cards are dealt, players decide which card they put into which hand. They don’t have to put one in each row, they can leave one or even two blank at first. Then, three more cards are given to the players. They pick two to keep and discard one. They set the new cards in whichever row they want to. This is repeated 3 more times until all 13 places are filled on the board. It is very important that your back hand beats your middle hand and your middle hand beats your front hand (standard Hold’em hand ranking applies). If your hands would chop in Hold’em, that’s still good. If you fail to set your cards that way, your opponent automatically wins the hand. This is what’s called fouling – make sure to avoid that. If someone fouls, they lose six points to each none-fouling player. If at least two players made legal hands, they compare their hands – front hand to front hand, middle hand to middle hand and back hand to back hand. If a player beats the other player’s all three hands, it is referred to as “a scoop”. The winner receives 6 points, while the loser loses 6. If one person wins two hands, they get 1 point while the one they beat loses 1. If a player can only beat one hand – since that means their other two hands were beaten – they lose 1 point and their opponent wins 1. If you’re lucky, you can also get into Fantasyland. You need to make a pair of Queens or better in your front hand and avoid fouling in order to achieve that. If you’re in Fantasyland, you get 14 cards at once. You have to choose one to discard and then you get to arrange your three rows without having to draw and having to make decisions without knowing what your next card is. Position is very important in this game too – if you get to act after your opponent, you know what you have to beat in which hand. Evidently, as the hand develops, you’ll have an idea about what the other player is likely to have by the end of the hand even if you’re out of position. You need to look out for blockers. See what’s out of the deck so you don’t chase cards that are already dead. And lastly, it is crucial to avoid fouling. This is especially true if you see that you can beat your opponent’s board. This means try to avoid having better hands in the front hand from the very beginning. Also – this holds true more for regular OFC than Pineapple – usually you’re better off filling up the front row before the last draw, mainly if you don’t have a very strong hand in the middle. That way you avoid having to put the last card up front no matter what it is, having to make a foul that way and hand your points over to the opponent. Open-Face Chinese Poker was discovered by the online poker community in 2012. Back then, as a piece in Bluff Magazine points out, most of the material on the game online was in Finnish. 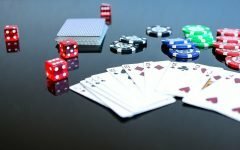 After some digging and posting on the 2+2 Forum, people online found out that OFC was in fact played in Finnish land casinos – although some players there claimed that the game was invented in Russia. Don’t get confused by the name – “Chinese”, this refers to the poker game family, not its country of origin. Later in 2012, OFC was also discovered by some of poker’s biggest names who talked avidly about their experience with the game. Soon it spread to American and European casinos. On the forefront of this “movement” was Jason Mercier. He was followed by other well-known pros who often played against each other for high stakes on the mobile app Pineapple. In fact, in February 2017, somewhat of a scandal broke out involving OFC. The aforementioned Mercier accused a player named Fernando Rosas of using solver bots to cheat on the Pineapple app. According to Mercier and his wife, Natasha, Rosas played significantly worse live than on the app where he was virtually unbeatable. However, despite being heavily talked about, OFC never made it to the PokerStars game selection or to the World Series of Poker. A live event was featured in the 2013 PokerStars Caribbean Adventure and another one in the Carnivale of Poker the same year. Now, the popularity of Open-Face Chinese Poker seems to be on a decline. It looks like it got replaced by another novelty, the 6+ Hold’em among high stakes pros who like to try new games. As we mentioned, 5-time WSOP bracelet winner Jason Mercier was among the first ones to pick up Open-Face Chinese Poker and talked about it frequently in public. Other famous players followed him, such as his wife, Natasha Mercier; also, Shaun Deeb and Gus Hansen. In 2014, the first ever World Championship of OFC High Roller was won by American chess and poker player Jennifer Shahade.